Home » Ashland » Local Impacts to changing Global Recycling Markets, We must clean up our act! Recycle right! We must clean up our act! Recycle right! Richmond, VA- Recycling needs OUR help! The recycling containers are for recyclable items ONLY. 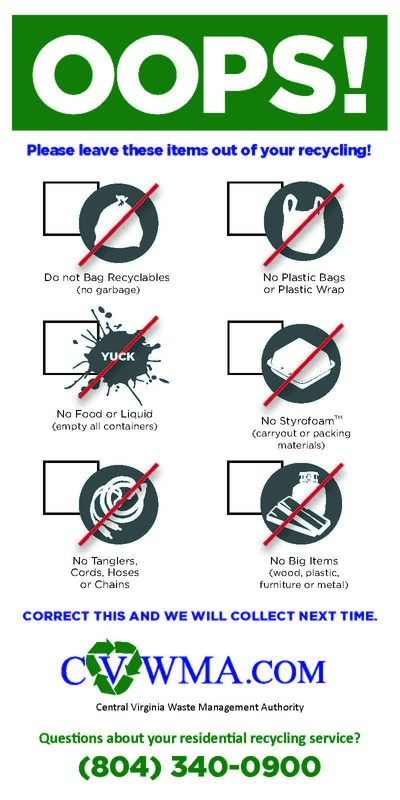 Placing items, such as plastic bags or food contaminated containers, that are not accepted in your curbside recycling cart/bin or the drop-off recycling containers cause contamination issues and add additional processing and disposal costs. Please place LOOSE acceptable items ONLY in the recycling container. Do NOT bag your recycling in plastic bags. Anything in a plastic bag will not be recycled! CVWMA’s recycling vendors will no longer pick up unwanted items like plastic bags and other non-recyclables, including food contaminated containers. To avoid this, visit cvwma.com and make sure you Recycle Right! Why is this now more important than ever? Nearly all of the paper and cardboard collected in central Virginia for recycling was marketed to paper mills in China. Yes, “was” is the operative word. China “was” the largest importer of recyclable material in the world until recently when they have stopped allowing certain commodities such as mixed paper into the country because of poor quality. In other words, when non-recyclable items, like plastic bags, get mixed in bales of paper or cardboard, it contaminates the paper, and the Chinese are tired of buying poor quality feedstock for their mills. Shutting off the world’s largest importer of recyclable materials has driven market prices down to a level that is not sustainable and has even rendered at least one-third of the volume collected in residential and drop off recycling programs to little or no value. This is forcing recycling companies and municipalities to question the economic viability of recycling, especially products such as mixed paper and glass. The continued success of recycling programs locally and globally is dependent on economically feasible end markets. In the past, revenue generated from the sale of recyclables has covered labor and equipment necessary to sort, bale and transport the commodities to respective markets. 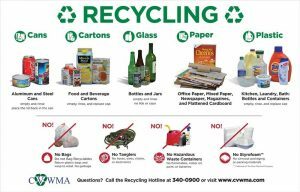 CVWMA collaborates with 13 local governments in central Virginia and provides residential recycling to 275,000 households in 9 jurisdictions and also provides recycling opportunities at 35 drop-off locations for cardboard, paper, cans, bottles, cartons and other plastic containers. The Authority has made significant strides in encouraging recycling by making it more convenient – picking it up on the curb, no need to sort, providing large recycling cans, and adding commodities to recycle even more! Has all of this been to a detriment? The answer is NO – but we do need to work together to cleanup recycling so it is sustainable in the future. This situation with China and the recycling markets has created a disruption in the industry, the reality of which will reveal the true costs of recycling, particularly as markets fluctuate and local processors seek new outlets to sell collected commodities. Moreover, we don’t want to lose the recycling momentum we have spent the better part of 30 years fostering. We as many communities across the country have been hopeful that the situation would change sooner rather than later. But, we can’t keep waiting. We need to accept and adapt this new ‘normal’ which will mean adjusting behavior and facing increasing costs to localities and thus residents. What lessons have we learned from all of this? “The most important is that you can always find a market for a quality product. China doesn’t want poor quality feedstock materials and neither do we. The answer is to do a better job of preventing undesirable materials from getting into recycling bins/carts to begin with…” according to Lori Scozzafava, senior vice president of Gershman, Brickner & Bratton Inc., a national solid waste consulting company. CVWMA is taking immediate steps to educate and inform central Virginians on the impact our actions have on the continued success of our recycling programs. We are working with the Recycling Partnership, a national nonprofit organization that leverages corporate partner funding to transform recycling for good all across America. “Our engagement with community recycling programs is made possible thanks to the support of funding partners and has never been as important as it is right now. When recycling is done well, it supports jobs, the environment, and the economy in towns nationwide,” per Keefe Harrison, Executive Director. Bottom line: Recycling needs OUR help! Whether your recyclables are picked up from your home or whether you drive them to a drop-off site, place LOOSE acceptable items ONLY in the container. Do NOT bag your recycling in plastic bags. CVWMA’s recycling vendors will no longer pick up unwanted items like plastic bags and other non-recyclables, including food contaminated containers. 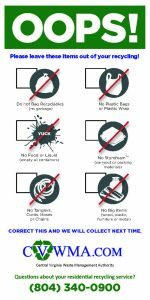 If you find an “OOPS” tag on your bin or cart and your recycling was not collected, then you may have included items that are not acceptable. To avoid this, visit http://cvwma.com/programs/curbside-recycling/what-to-recycle/ and make sure you Recycle Right! Then share this information with family, friends and neighbors! We know there will be some challenges and frustration as we navigate our way to a new normal but at the end of the day, with YOUR help, we will transform recycling into a thriving, sustainable benefit for our community. 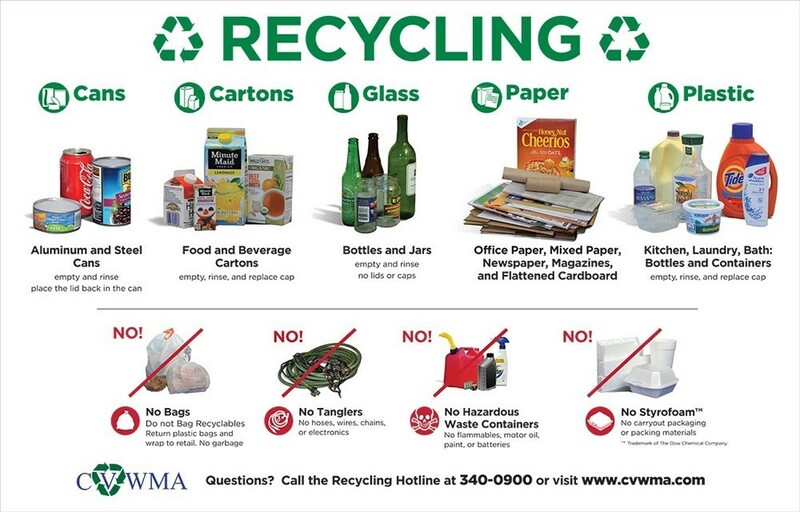 For additional information about CVWMA programs, please call CVWMA at (804)340-0900 for recycling or (804) 425-0500 for trash collection or visit www.cvwma.com, CVWMA on Facebook, CVWMA on Twitter, and CVWMA on Instagram.